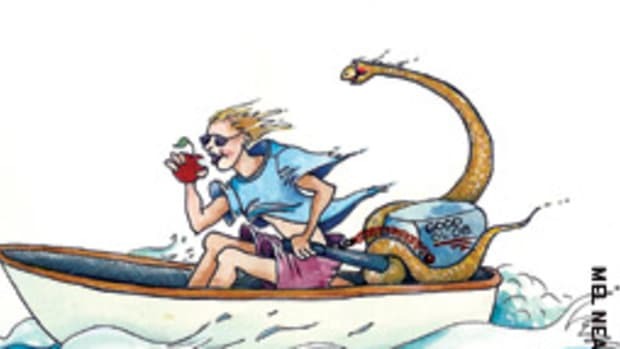 I don’t know what that thing is hanging off the stern of my boat, but I know danged well it ain’t no outboard. I know what outboards are. I’ve been dealing with them for more than 50 years. I’ve had so many I don’t even know how many I’ve had. I’ve traveled thousands of miles with them, and I think I should know what they’re all about. First you squeeze a bulb until you flood the carburetor. Then you choke it to make absolutely sure you’ve flooded the carburetor. Then you start cranking it. Then you remove the cowling and spray ether into the air intake. Then you start it. Then it coughs and roars and bucks and splutters like it’s going to pull your transom off. Then it spreads enough smoke to kill every mosquito on the creek. Then a film of oil spreads on the water all around your stern. Then some lady jumps out from behind the trees on the other side of the creek and yells at you that she’s going to call the EPA. Then you remember you forgot to unchoke it. You do that and it starts to die, so you shift it into gear to speed away before it dies. Then you find out you’re still tied to the dock because you were afraid to untie before you knew the thing was going to start. This thing hanging off my stern doesn’t do any of that. Just turn the key and it starts, like one of those slick new cars you see movie stars driving on television. You walk back and touch it to be sure it’s running, and then you remember that all you have to do is look down at the gauges and they tell you it’s running. I’m not sure what’s going on here, but I can tell you it’s not like the good ol’ days. When I was around 10 years old, I used to sing a country song to my 5-hp outboard. As I sped down the river in my 12-foot skiff, I sang the song about someone with a hummingbird heart. It really didn’t have anything to do with outboards except, I thought, that the refrain about “hum hum of your hummingbird heart” described my outboard perfectly as it hummed along, taking me down the river to fun and freedom. But as I grew a year or two older, I found that other parts of the song were more appropriate to outboards — the parts about the person with the hummingbird heart not being at all reliable. My outboard soon started letting me down, and they’ve been breaking my heart ever since. You might say I’m nuts to have had so many. You might say I’m hooked on them. But that’s not the way it is. I’m just a guy who’s been on the water all his life. And I’m just a guy who’s lived and cruised on a boat for 30 years. (OK, so you’re right about the “nuts” part.) So outboards have been a necessary evil. At least that’s the way I’ve always thought of them. But I’ve just been forced — kicking and screaming (well, almost) — into the world of modern outboards. 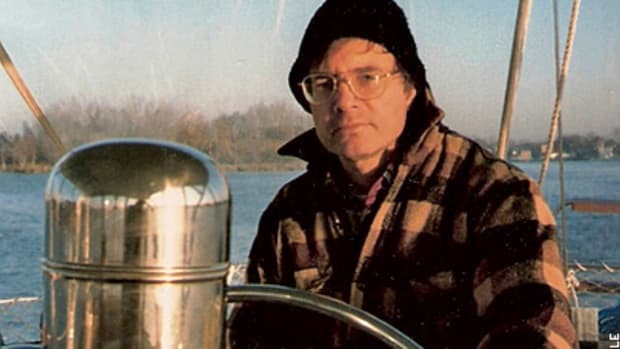 I was forced by a failure of a single component in an outboard that had been ridden hard and put away wet most of its 24 years of life. It had come to me hooked to the stern of a 1985 20-foot Mako I bought from a friend years ago. I’m sure this 200-hp 2-stroke beast was marvelous to behold when it was new, but when I got it the motor was running a close second to Methuselah, as outboards go. It was not only old — it was gray, rusty, bent and broken, not used enough at times, run too hard at other times and, in general, was something only a fool would buy. 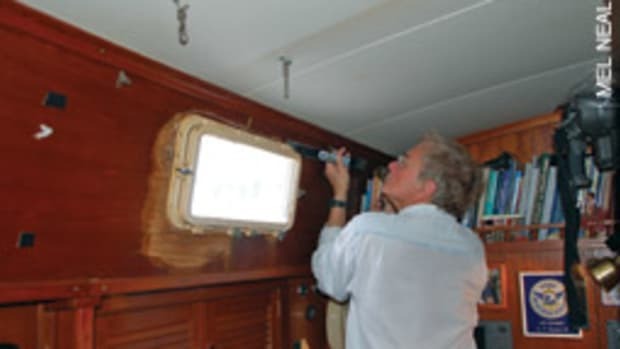 But this fool did because I loved the boat to which it was hooked and because of my deep and abiding faith in my ability to fix things — not to mention my belief in spray cans of ether. Nevertheless, it gave us great ride after great ride after great ride. 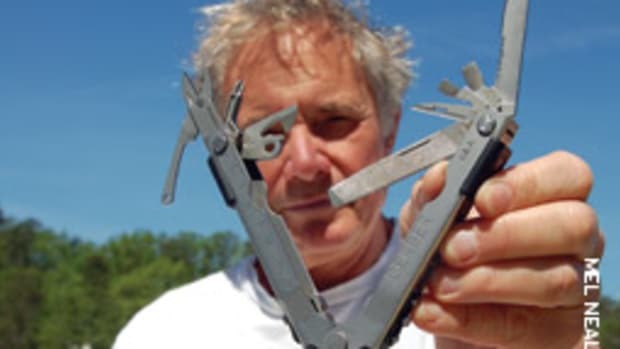 But in the last few years peripheral parts began to give me trouble, just as you’d expect with something mechanical that’s been used in salt water for that long. I guess you could say these were just everyday ho-hum problems. You could say. But I said a lot more each time something broke, slinging out cuss words better than I used to spit watermelon seeds when I was a kid — and I was a watermelon seed spitting champion in my youth. The two thermostats hung up suddenly, but I found out that someone in the past had put in thermostats for an entirely different engine. The oil filter screen in the bottom of the oil tank clogged, the filter clogged, and the oil level sending unit started hanging up. (But the alarm worked perfectly, and no harm was done, except to me.) The remote throttle/shift control crashed until I took it apart, found a bent piece of metal, straightened it with a pair of Vise-Grips, and put the mess back together again. This took two entire days because I didn’t have a clue as to what was going on inside that simple-looking control. A high-pressure hydraulic line for the tilt motor blew a pinhole leak so small that I couldn’t see it until it splattered on my glasses while I was trying to see it. I’m a hands-on type of guy. I have to be. I’m on the water all the time, and I’m not rich. So I fixed things and I fixed things. It got to the point where I couldn’t go to a friend’s for dinner in that boat without taking along my work clothes so I could change when I handled the current disaster en route. But the basic outboard just wouldn’t die. I began to even wish it would quit so I’d be forced to get a new one, but it wouldn’t oblige me. 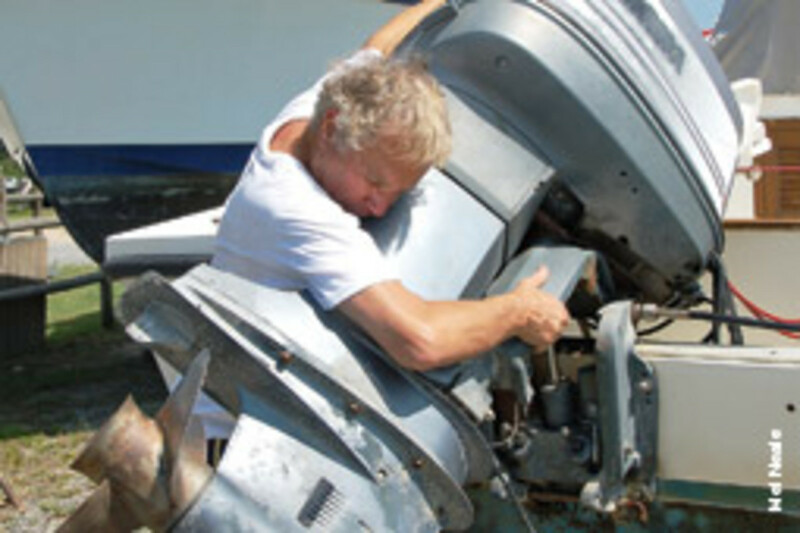 Although little fixable things on it would succumb, the outboard itself kept running like new. I developed a love/hate relationship as I fixed things, and that motor just kept on roaring. Finally, a short while ago, a day of historical significance dawned. Jessica called. She and her husband, Todd, are good friends of ours. She said her husband had a “situation” and wondered if I could help. 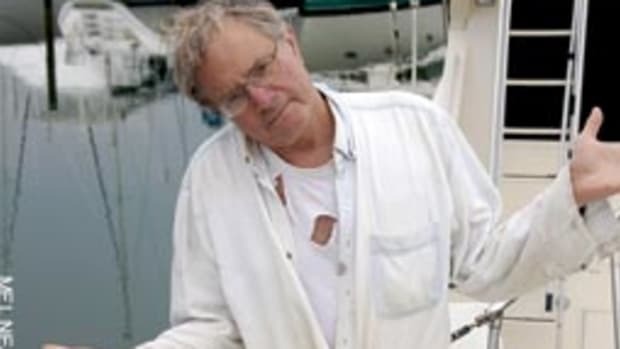 The situation was his outboard had broken down while he was out pulling his crab pots. I always believe in helping friends — not to mention that I love crabs — so Mel and I didn’t hesitate to fire up my outboard and head out to the rescue. The mission was successful, and soon we were all back at our docks. That evening, Mel and I decided to take a little pleasure ride. The motor fired off and I put her into reverse, backing away from the dock and out to the middle of the creek. I put her into forward to head on out into the river. She didn’t go into forward; she remained obstinately in reverse. At least I’m not swimming her in, I thought, as we returned backward to our point of departure. After 24 years in salt water, the steel shift rod running down the lower unit had rusted through. (Now they’re made of stainless.) Of course, this had nothing to do with the towing, but I’ll never admit that in the hope that it’ll get me an extra crab or two. The unbelievably frustrating thing is that the powerhead still runs like a champ. Anybody need a good powerhead? Anybody need two stainless props? 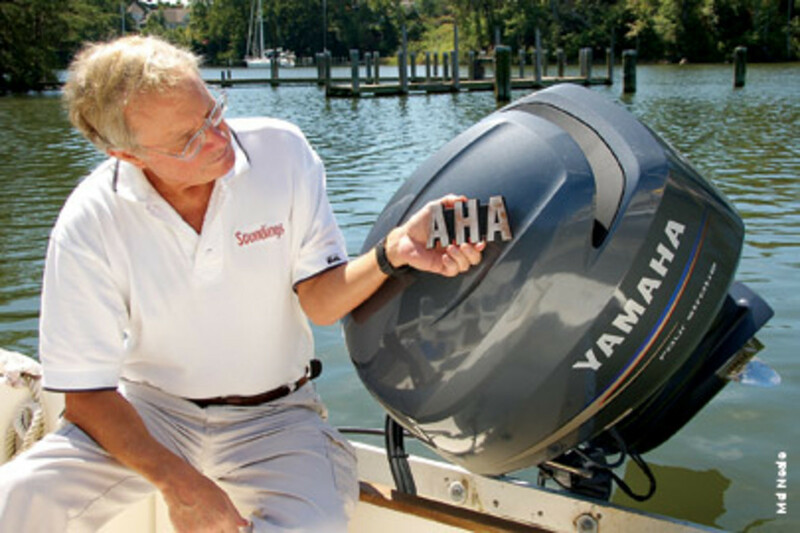 In case you’re wondering about the brand of this 200-hp outboard of seemingly eternal life, it was an “AHA.” It had started out in life as a Yamaha, but the first three letters on the sides of the cowling had been knocked off during various docking mishaps by previous owners and friends. I first got turned on to Yamahas some years ago in the out islands of the Bahamas, where it seemed that just about everybody on the water had one. There are far more outboards than cars around most of these islands. Actually, most of the islands in those days didn’t have any cars. 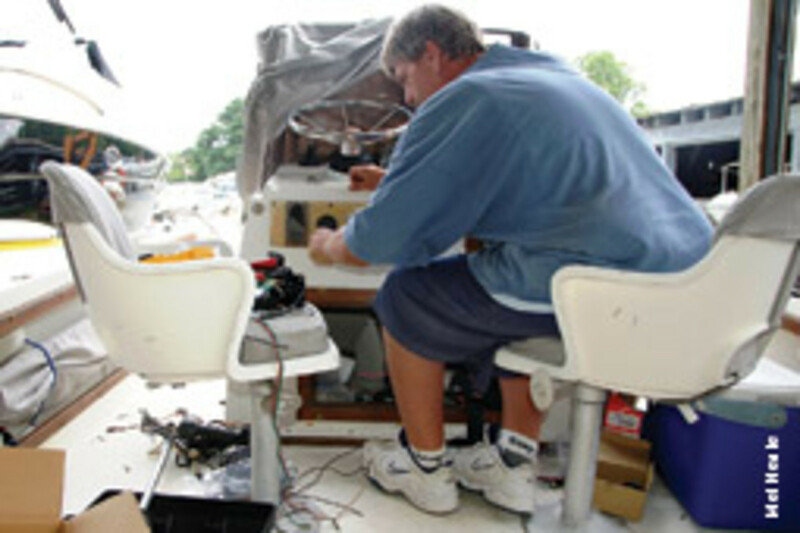 In the out islands, a reliable outboard wasn’t just a matter of convenience. First, there were very few places at that time that could do serious work on them. And, more importantly, an outboard that quit on you could easily leave you stranded. This was before EPIRBs and few, if any, boats would be around to hear a VHF call for help. I spent many a day fishing in Exuma Sound in an old 22-foot Mako powered by a Yamaha without another boat in sight or to be heard on the VHF. It was nice. I took note: These people probably know something. Then, many years ago, I put a Yamaha 25 on my aluminum dinghy. This motor didn’t exactly live in ideal conditions. Getting gasoline at a marina in the Bahamas in those days was interesting. I watched once as a tanker, moored off the island, put a hose ashore by having it dragged through the sea with ropes. It was then pulled up a hill to the marina fuel tank — all with no cap on the hose to keep out the seawater. So you were never surprised when you sometimes got a little ocean water for no extra charge when you filled your tanks. The motor has also had lots of use in the States, including exploring much of the northern Chesapeake for a guide I wrote. And the thing is still running. So it was a no-brainer to me. I called the Yamaha people when I knew I was finally to the point where I had to repower my 24-year-old Mako. I should make something very clear here. 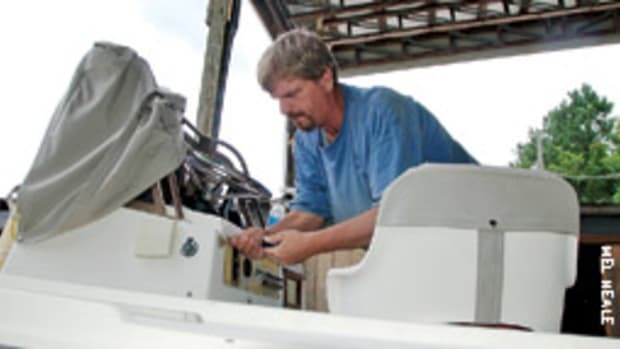 I’m not an outboard tester, I’m not a scientist, I’m not an engineer, and I’m not a real mechanic. I’m just a guy who’s suffered with outboards for the vast majority of his life. So I don’t know who makes the best outboard and I don’t mean to imply that I do. I’m just telling you about my personal experiences. This, of course, includes my mistakes. One of them was that when I realized I had to get another outboard I thought I was simply going to be continuing on with outboard-inspired mental anguish and self flagellation, which would probably be the same no matter what motor I got — simply because it was an outboard. I was in for a surprise. They aren’t outboards anymore. Yeah, they hang over the transom like outboards, but compared to everything I’ve experienced during the last 50-plus years, these aren’t outboards. Saying they are would be like saying the Wright brothers flew the space shuttle. It’s not the same thing. Now if you’re one of the lucky folks who has bought one in the last few years, you know what I’m talking about, and you’re probably wondering why I’m just now waking up in the 21st century. (Did I get the right century?) But if you’ve been putting it off like me because you didn’t want to spend the money to get a shinier version of the same old pain-in-the-neck, you’re in for a very nice surprise. For years, I swore I’d never get a 4-stroke outboard. My reasons included objections such as too much weight, too many parts and too many strokes. Usually it hurts to be wrong, but this time it’s wonderful to have not only been wrong but so wrong. I got a Yamaha 150-hp 4-stroke. I didn’t get a 2-stroke because so many good mechanics were saying 4-stroke. I didn’t get a 200-hp because a 4-stroke weighs more than a 2-stroke, and I didn’t want to add that much weight to my transom. I figured I could live with the slower speed. Wrong! I didn’t need to. My old Mako with the new 150 goes much faster than it did with the old 200. Whelan’s Marina on the Northern Neck of Virginia (www.whelansmarina.com) did the “installing.” The Northern Neck is an area we love, except that it’s getting far too crowded. But it’s still a rural area. It’s country. Although I’ve been a seaman (of sorts) most of my life, I’ve also always been what I understand stylish people everywhere are now calling “country.” This may seem incongruous, but I don’t care. You’re what you are, even if it is a little weird. So I felt really good when we drove to Whelan’s to check it out. The country road took us through forest. It took us through fields high with corn, fields green with beans, and fields fenced in with livestock grazing. We passed an old church and what had probably been a country store or two. When we got to where the new motor was going to arrive, we found something special. It seemed more of an institution than a marina. It’s owned and run by a local family and it should come as no surprise that they are the Whelans. 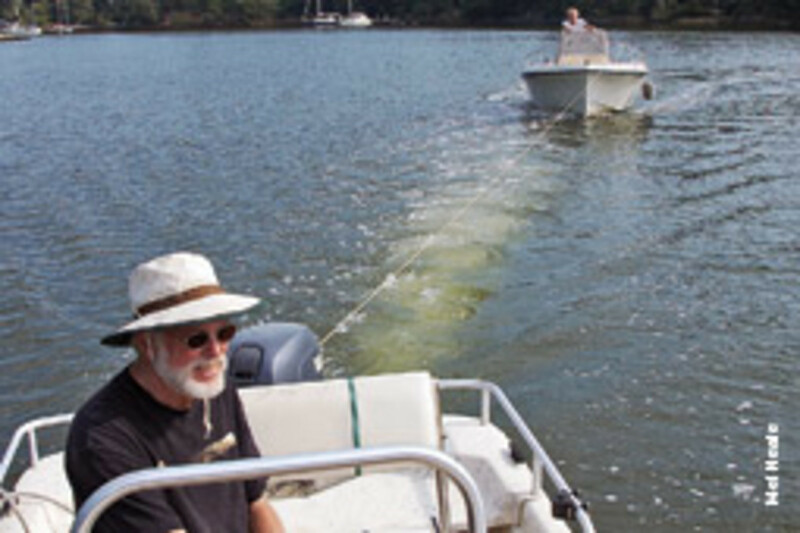 The place had a priceless combination of old-time country flavor and modern-day technical expertise for boats. Although there is a 10,000 pound lift, a John Deere tractor does many of the launchings, as well as a lot of other things. A neighbor, Jay, towed my broke-down boat to a nearby ramp, and Morris, a friend with a pickup truck — it’s important to have friends with a pickup truck, unless you have one yourself — hauled it to Whelan’s. John Whelan, the patriarch, is usually on-site, making sure all is operating well and that customers and visitors are feeling at home. Keith Whelan is John’s son and the general manager. I told Keith I wanted to get back in the water with my new motor as quickly as possible. I got the impression he’d heard that before. 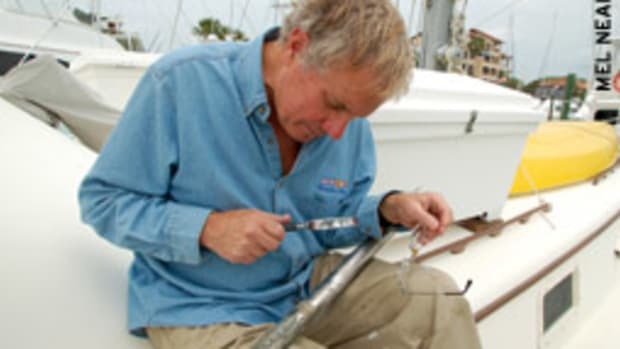 “We’re going to need to do some things to that boat to get this done right,” he explained. When the engine arrived, it was packed securely in a huge box. I felt like it was Christmas. We peeked in, but couldn’t tell much — just that it was there, waiting for a ride. We watched Todd Grenier, a certified Yamaha mechanic (not Jessica’s Todd), as he did the installing. The guy amazed us as he pulled out old stuff, put in new stuff and made it all work in what seemed to us like record time. 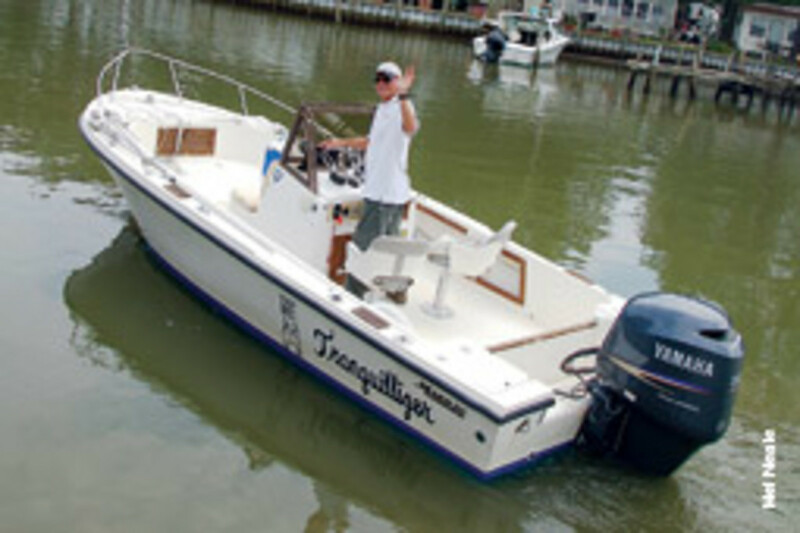 We took it out for a preliminary sea trial, and he started to explain some things. The first thing I noticed was I could hear him talk — with the motor running. As I listened, my mind glazed over. I wasn’t trained to fly, I thought. This motor has Yamaha’s Command Link system of gauges that tell you just about everything you would ever dream of wanting to know about what’s going on with the outboard, and a lot of things I’d never dream of wanting to know. Like how many gallons an hour you’re burning. In the past, I’ve tried to keep that little thought far from my mind. No way did I want to know that piece of deadly information. It spoiled the fun completely. But now I can look at a gauge and know the exact number of gallons per hour I’m using at the moment. And I can handle it emotionally because I’m consuming so much less than what I was consuming before. And I have a working fuel gauge. I’ve never had one of those before. I’ve had plenty that didn’t work, but not one that does. It’ll also tell you how long your trip has been, how many miles per gallon you’re getting, your speed, motor diagnostics and even how many gallons you’ve used since the last time you filled the tank. I could go on and on. This new motor turns my old Mako into something that feels like a jet plane when I look at those gauges. It also makes it feel like a jet plane when I give it the throttle. And I’ve found that it is. And you know what? I kind of like that. realized that there was a very serious problem. Unfortunately, this time I could hear myself sing.